A brand new bundle of radio stations will be launching from 29th February 2016 - with all eighteen planned to be broadcasting by the end of March 2016. talkRadio, Virgin Radio and Jazz FM are all joining national digital radio. There is a full list of stations that will all be on-air by the end of March 2016. How will I know if I can receive the new stations? What will the coverage be like? The multiplex operator's technical plan is for services to reach more than 73 percent of UK adults (15+), 63 percent of major roads and an estimated 88 percent of vehicles on the UK road network, using more than 45 transmitters to provide indoor and outdoor coverage. More and more transmitters are being installed between now and 29th February. Coverage will extend for large parts of England, including major cities like London, Birmingham, Manchester, Liverpool and Bristol. Areas that won't receive the new bundle of stations includes East Anglia, parts of the South East such as coastal and inland areas of Kent and most parts of Cornwall. Central Scotland - areas around Glasgow and Edinburgh, South Wales, including South-East Wales (Cardiff) and South-West Wales (Swansea) will also be able to receive the stations. Parts of North-East Wales are also in the coverage area for the new bundle. There'll also be some coverage in Northern Ireland - in and around Belfast. How can I check with my DAB radio if I can receive the new stations? 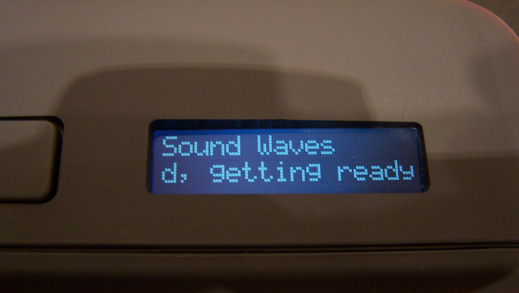 Test transmissions are now being broadcast on transmitters that are up and running - two test stations called Sound Waves (or just Waves if your digital display is of the shorter type) on your DAB radio station list and Sound Waves + (or Waves + if your DAB radio has a shorter display) are being broadcast. You'll need to retune your DAB radio to see if you can pick up the bundle of stations on channel/block 11A. If you can't get the two stations above, keep retuning between now and 29th February. Three of the stations are broadcasting using the more efficient DAB+ standard. If you can't hear anything, you will need to check if the software in your radio can be upgraded to receive DAB+ broadcasts. If you've a Pure-branded DAB radio, check the Pure Upgrade website with your radio's serial number to hand, to see if you can upgrade to DAB+. You may have to pay for the upgrade. Roberts Radio have user guides for all DAB radios - look for the DAB+ logo to see if yours can receive DAB+. Check on your DAB radio or on the box for a DAB+ logo or digital tick, to confirm you'll be able to hear three extra stations - Jazz FM, Magic Chilled and Fun Kids, which will be using the newer and more efficient DAB+ standard to broadcast. To receive DAB digital radio services, you need a type of radio designed to pick up digital broadcasts over the airwaves through its built-in aerial. We've links to good models on our pages, or scroll down the page for some quick links to both DAB and wi-fi receivers featuring DAB+. If you can't listen using a DAB radio, you can always listen online using an internet radio. 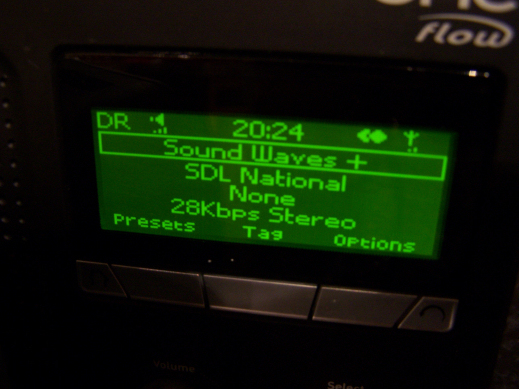 Above: Pure One Flow and Goodmans Pebble receiving DAB+ and DAB test transmission of Sound Waves and Sound Waves + station broadcast on SDL Sound Digital DAB multiplex.